Cascadia Capital, an investment bank serving middle market clients globally, today announced it acted as the exclusive financial advisor to Concord III, LLC (“Concord Technologies”) on the sale of a minority interest to Excellere Partners, a Denver-based private equity firm. Concord Technologies, based in Seattle, Washington, is a leading provider of interoperability and automation solutions to high-growth healthcare markets. With over 1,500 customers already utilizing its existing enterprise fax services, the Company recently launched an additional workflow platform called NEXTSTEP, focused on healthcare interoperability, to further enhance its product suite. Cascadia ran a targeted process to help Concord Technologies’ Founder and CEO choose the ideal partner with which to expand the Company’s service offerings and footprint in the market. 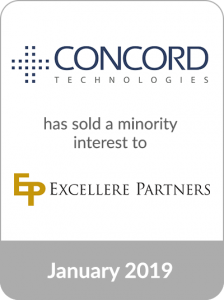 After a careful evaluation process, the Company chose to partner with Excellere Partners due to the investment firm’s deep healthcare industry expertise and strong relationships with companies in Concord Technologies’ targeted end markets. The minority sale represents another successful transaction for Cascadia Capital in the healthcare group. Recent transactions in the sector advised on by Cascadia include ADURO’s financing with Abry Partners, SonoSim’s financing with GE Healthcare, and DatStat’s acquisition by SCI Solutions.